Our three-year course incorporates the core values of the NHS constitution to help prepare you for the challenges of working as a physiotherapist in contemporary healthcare. Approved course- Our physiotherapy course has been approved by the Health and Care Professions Council (HCPC) and the Chartered Society of Physiotherapy (CSP). Full membership- When you graduate, you can apply for registration with the HCPC and, once registered, you can apply for full membership of the CSP and Chartered Physiotherapist status. Real-world experience- You’ll spend a minimum of 1,000 hours on physiotherapy placements in a clinical setting and you can spend your final four-week placement abroad. "After a guest lecture from Antony La Mola (Clinical Lead at Brain Wave), I was able to gain some work experience with him. I am now working at Brain Wave part-time with the provision to go full-time once I have qualified"
However, as a chartered physiotherapist, you could work in the NHS or the private sector. The organisations you might work at include hospitals, sports clubs, in the community and care homes, and schools. Grades ABB at A-level (excluding General Studies), must include a biological science (Biology, Human Biology, Sports Science or Physical Education are acceptable). A-level Reforms - From September 2015, applicants undertaking A-levels in Biology, Chemistry or Physics will be expected to pass the Science Practical assessment. We do not accept Extended Project or A-level General Studies. DDD in BTEC Extended Diploma in any of the following: Sport and Exercise Science, Applied Science, Applied Science (Medical Science), Health and Social Care (Health Studies), Health and Social Care (Health Sciences). We do not accept the following:- Sport, Sports Therapy Sports Development, Coaching and Fitness, Performance & Excellence. Please note that we do not accept Applied Science as a single BTEC Award as it does not contain sufficient Biological content for this course. 5 GCSEs Grade C/4 to include English Language, Mathematics and Science, excluding Physics and Chemistry . An interview is required for entry on to this course. We look for commitment to physiotherapy and it is helpful to have undertaken some work experience or shadowing. It is important that you have a clear and realistic idea of the work of a physiotherapist so that you are able to make an informed choice of career. The Manchester Movement Unit is a physiotherapy clinic based in the Brooks building. Even though the clinic is based in the university, we’re open to everyone. If you chose to study for an extra sports massage qualification alongside your degree, you may have the opportunity to work at events such as the Manchester 10k and the Manchester Marathon. Our aim is to help you become a confident and independent physiotherapist. We want you to make informed decisions about the best way to care for your patients. You’ll be based in our contemporary Brooks building, with access to our real-world clinical equipment and facilities. Day-to-day, you’ll be taught using a variety of methods including lectures, tutorials, group work and practical classes. You’ll practice your skills and techniques during simulated patient scenarios in our physiotherapy practice rooms. We have seven dedicated practice rooms which are available for you to book out, giving you a safe space to develop your expertise in a supportive environment. It takes practical as well as academic training to gain the skills you need to become a physiotherapist. 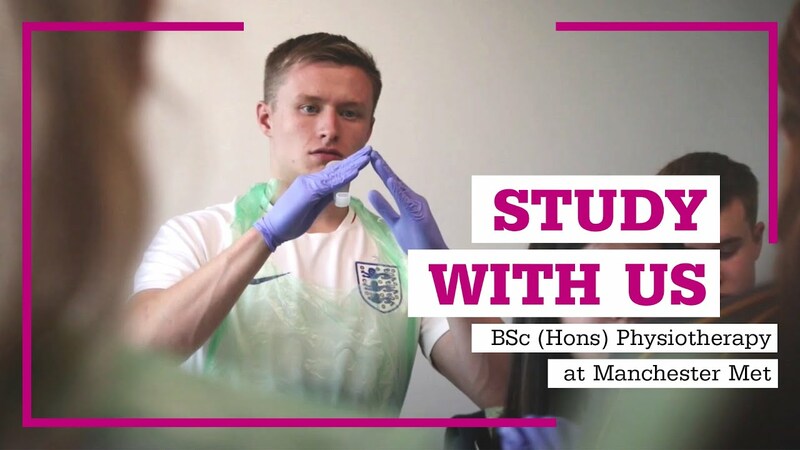 And nothing beats hands-on experience in a clinic – that’s why you’ll spend one third of this course on placements, completing them in each year of study. In year one, you’ll build a strong foundation of professional practice skills. Your introductory units will cover Musculoskeletal, Cardiorespiratory, and Neurology in detail, along with a practice placement to observe and participate in the management of patients. At the end of year one, you’ll attend a short observational placement in a clinical area of your choice. You’ll shadow a registered physiotherapist and see the theory you’ve learnt in the classroom put into practice. Year two has two units of study, the first delivered on campus, and the second a placement unit. You’ll build on and integrate the knowledge from year one, focusing on patient management skills. You’ll also undertake three practice placements, supervised by highly qualified clinicians and supported by our academic staff. In year three, you’ll study four units, with one placement unit (two 5-week placements) and three academic units. Focusing on evidence-based practice, the transition to professional practice as a new graduate, and research and critical thinking skills. You’ll have the opportunity to select options and use your research knowledge and skills to develop a research proposal. The final unit in year three is a practice placement, that is organised by yourself. This gives you the opportunity to choose a specific area of interest or take a placement overseas. To study on our BSc (Hons) Physiotherapy programme, you are required to complete an Occupational Health Assessment. This is to make sure that your health isn’t a barrier to achieving the programme learning outcomes or your eligibility to apply for registration with the professional body. This requires the completion of a health questionnaire before or during the first few weeks of your course, followed by an occupational health screening appointment if required. Appointments are held within the Greater Manchester area and the University does not cover travel costs. When you study for a degree course leading to professional qualifications at Manchester Met, we require you to follow professional standards and codes of practice during your studies. We’ll brief you on the requirements of professional standards and codes of practice at the start of your studies. If you fail to follow these standards and codes of practice, we may exclude you from the programme on the grounds of professional unsuitability. Professional, statutory and regulatory bodies require students to achieve results that demonstrate their ability to practise safely. Therefore, there are some exceptions to the standard University Assessment Regulations for those students, for example, limitations on exam resits and on compensation of failed marks. All of the books required for the course are available from the library. The University also has PC labs and a laptop loan service. However, many students choose to buy some of the core textbooks for the course and/or a laptop. Students may also need to print their assignments and other documents. Campus printing costs start from 5p per page. Estimated costs are £300 for a laptop up to £100 each year for books and printing. Uniforms: Full uniform is provided free of charge when the course commences. If students wish to replace any item of uniform or secure additional items of uniform throughout the programme (e.g. because it has been damaged or no longer fits) then they must order and pay for this directly with the supplier. There are certain exceptions to this, for example if the student becomes pregnant. These are detailed in the faculty uniform policy. Students can choose to purchase non-standard items such as fleeces directly from the supplier. You will need to purchase suitable footwear for practice. NHS Trusts require shoes (not trainers) that meet health and safety requirements. Advice will be given on what to purchase. There is a loose dress code for practical skills sessions (trainers, t-shirts and tracksuit bottoms) which should be purchased at minimal cost (e.g. there is no need for designer brand trainers). We strongly recommend that you purchase a number of items at the start of term which you will find useful on the course (e.g. a stethoscope, tape measure, scissors and goniometer) but it is not mandatory. These can be purchased at the book fair in Freshers week at reasonable prices (£20 - £30 in total). You will need to budget for travel costs to your placement which could be up to 80 kilometres from the University. Travel costs to placement will vary considerably depending on where you live, the location of your placement and how you choose to travel. Information on public transport costs within Greater Manchester can be found at www.tfgm.com. All NHS Trusts charge for car parking. The programme uses Moodle and each unit of study has a dedicated area. The programme team post resources/links to resources on Moodle and students are at liberty to print the resources in hard copy should they wish to. If printing is done using the university print services, the costs of a single sheet (black and white) is 5p (at the time of going to press). The programme allows students to arrange their final placement (Placement 3) overseas if they wish. Costs associated with overseas study are variable but will include flights and other miscellaneous travel, insurance (travel and, in some cases, additional clinical liability insurance) and subsistence (food, shelter). There are companies (such as Work the World www.worktheworld.co.uk OR Projects Abroad www.projects-abroad.co.uk/volunteer-projects/medicine-and-healthcare/physiotherapy, who undertake to arrange physiotherapy placements overseas. Costs incurred by students during placements 3 are not supported by Manchester Met and the student must meet all costs. here will be many opportunities for extra-curricular activity (including community engagement) and travel to and from venues/parking at venues will be funded by the student. Other qualifications (sports massage, sports taping, pitchside first aid) are periodically available but are optional, not mandatory. If students wish to gain these additional qualifications there will be additional cost. 2 extended years (45 weeks) full-time.